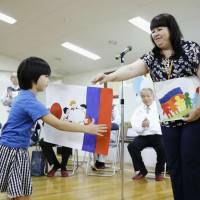 SAPPORO - Five Russian residents of one of the disputed islands off Hokkaido visited a quake-hit town in the prefecture on Saturday to encourage the survivors. 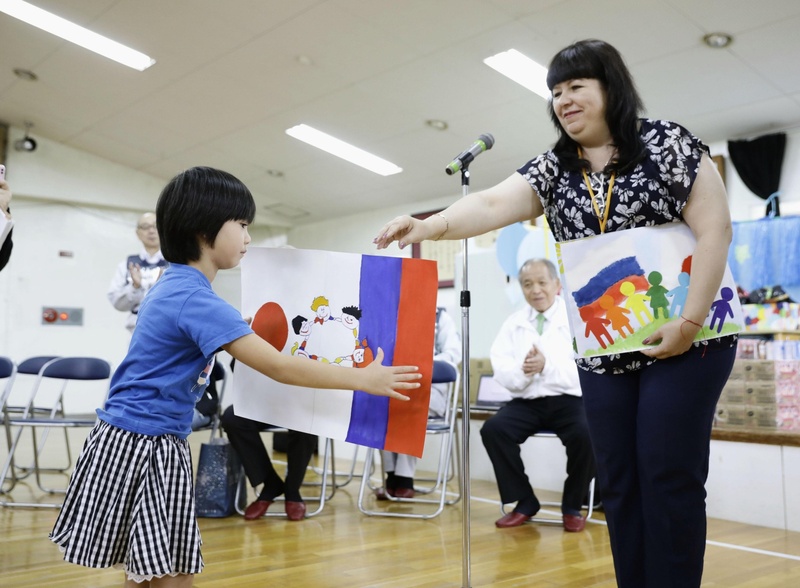 They are among 58 Russians staying in Hokkaido from Friday through Tuesday under a visa-free program to promote mutual understanding with former Japanese residents of the isles, which are under Russian control. The five presented paintings to children at a nursery school and helped distribute food to evacuees in the town of Mukawa. “I wondered what I could do. I hope this town will soon become restored,” Andrey Daneliya, 57, said after singing songs in Russian at the nursery school. Anastasiya Sedykh, 37, distributed water to residents at an evacuation site. “People replied cheerfully even though they have faced severe conditions,” she said. The magnitude 6.7 earthquake on Sept. 6 quake triggered massive landslides and killed 41 people, 36 of them in the hardest-hit town of Atsuma. The quake maxed out at 7 on the Japanese seismic intensity scale.